When the first taste of summer comes around the corner, I find myself dreaming of hammocks and iced tea, reading magazines in the sun and taking naps in the shade. Then June arrives, the weather gets warm, school lets out, and instead of relaxing, we all try to make the most of those extra hours of sunlight by packing in as much fun as possible. Isn’t that what summer is for?! Certainly that is how we’ve felt at the bungalow lately, with visitors coming into town, travel plans out of town, and trying to pack as many fun things into the moments in between. Yes, summer is definitely here, and I find myself creating simple, easy meals to keep up with it all. Today’s recipe is the epitome of summer simple. If you have avocados and toast, you have lunch, dinner, a delicious starter, or a satisfying snack. It’s quick, healthy, and has endless variations. The simplest version is bread, avocado, and a pinch of salt. Any bread will do. Here I’ve use a whole grain, but I also really love sourdough. A baguette would work well, fresh or even a day or two old. 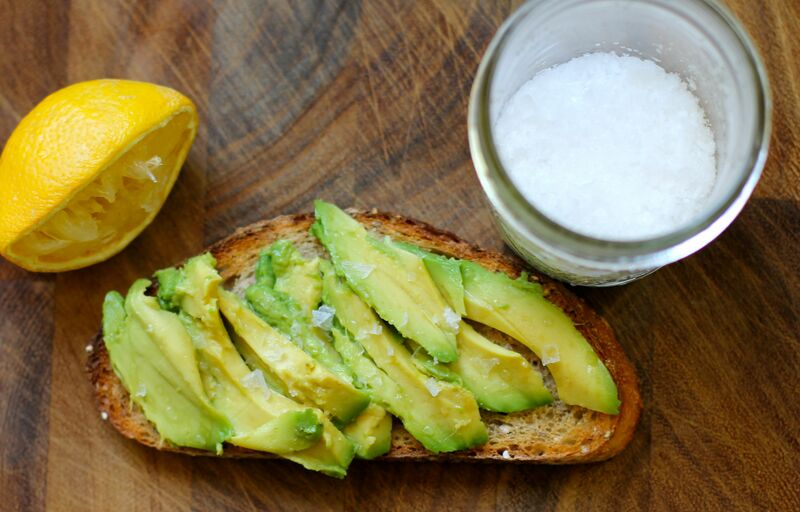 Toasting the bread adds a nice crunchy texture, and pairs well with the creamy avocado. If your bread is a day or two old, drizzle with a little olive oil and pop it into a hot oven (400 degrees or so) until it turns into a toasty crostini. The olive oil will add some nice flavor but it certainly not a deal-breaker. A squeeze of lemon brightens the avocado. You can also mash the avocado with a fork, adding lemon juice and salt to create a rough spread. Leftover guacamole on toast makes a repeat performance as a zesty lunch the next day. This combination begs to be made into a sandwich with a juicy tomato from the garden and some fresh lettuce. Add a couple pieces of chicken or steak from last night’s meal (likely from the grill), and you’ve got one delicious sandwich. Leftover garlic bread makes a nice vessel for avocado. Here is one of my favorites. What I love about avocado toast is that by itself, it’s delicious and satisfying. As you can see, it’s also a great starting point for something more substantial and delicious, inspiring additions of whatever you have on hand at home, or perhaps you’re at a summer cabin, staying with family, or renting a house with an ocean view. Wherever you are, this is a great way to eat deliciously ~ and quickly ~ so you can get back to enjoying your summer.